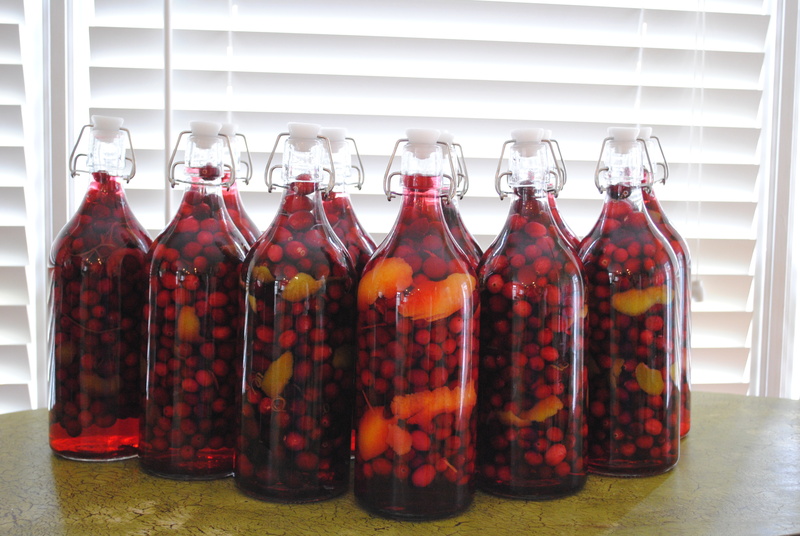 Homemade Flavored Vodka. The PERFECT Gift! So, every year I give homemade gifts. From Tins filled with cookies and candies, homemade canned goodies from the garden, jams and jellies, to scented bath salts and oils. No matter what I give, one things seems clears. There is always one favorite: ALCOHOL! I could literally go on and on. And that’s not even including baked goods. I’ll save that for another day and get back to why you come here. Vodka. 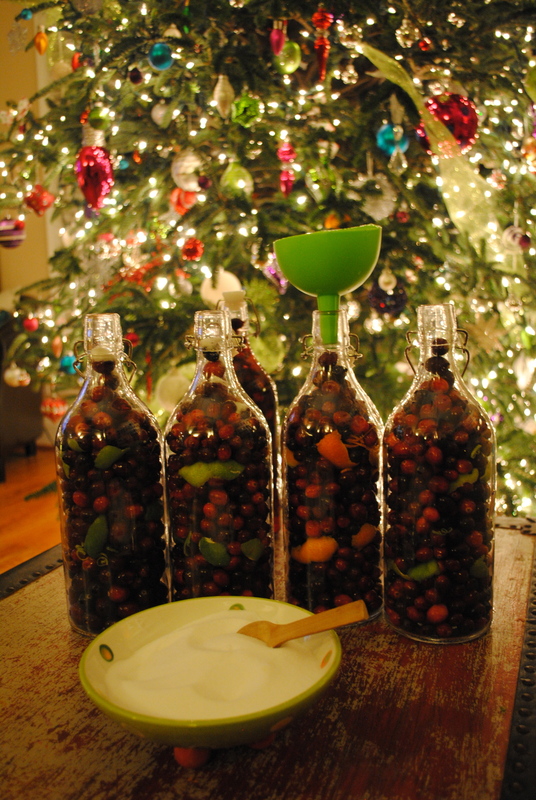 Sweet Delicious Elegant Festive Vodka. Gather Your Ingredients and Settle In! 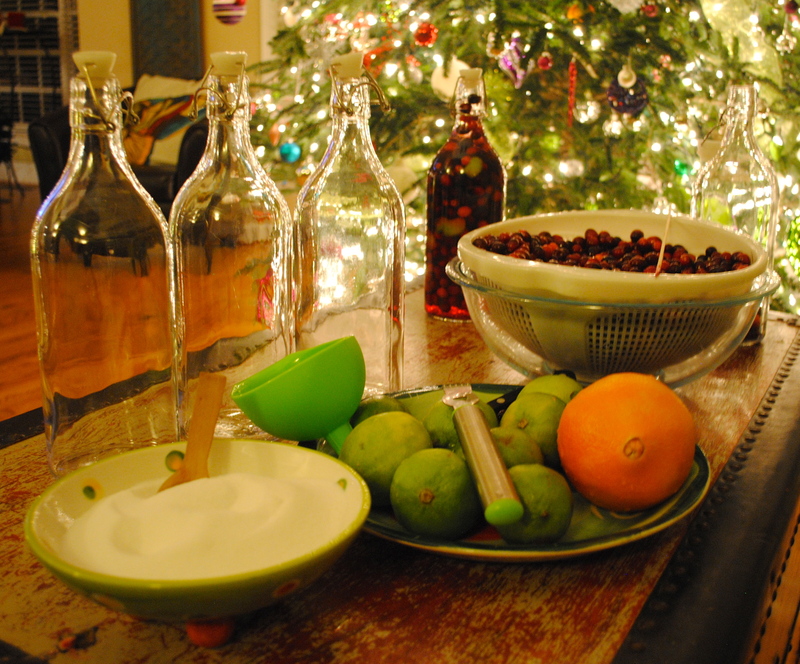 Resealable Glass Bottles, Cranberries, Limes, Oranges, Sharp Paring Knife, Bamboo Skewer (or poker of some sort), Citrus Zester (if you want), Sugar, Funnel. Get Your Work Station READY! Ok, now here’s where all your time is spent. 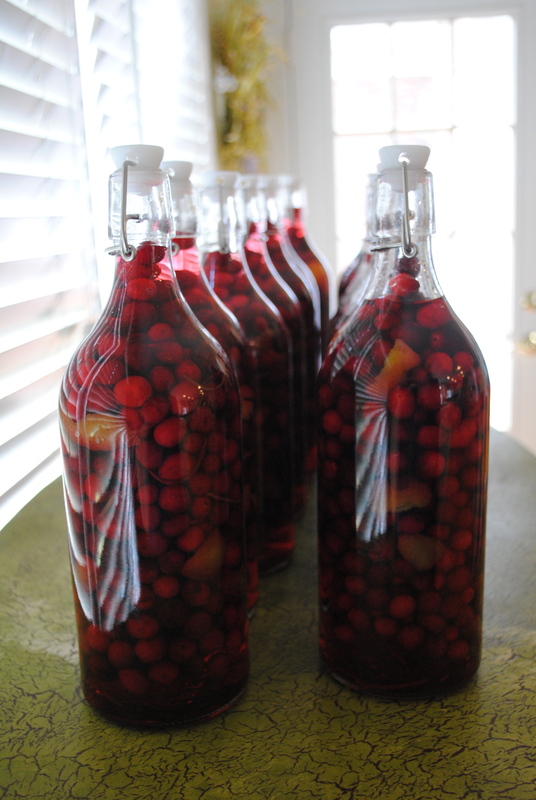 For EACH LITTLE CRANBERRY, YOU MUST POKE A HOLE IN IT BEFORE dropping it into the bottle. I found the best tool for this was a bamboo skewer, but you could also use the tip of your pairing knife. 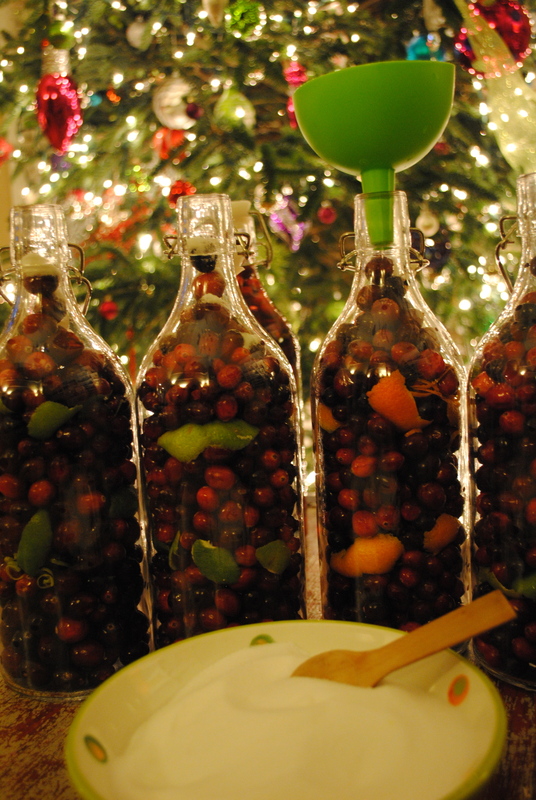 You don’t have to put it all the way through the berry, just a little POP to break the skin so the gorgeous vodka can penetrate the hard skin of the cranberry and get that vodka flavored! 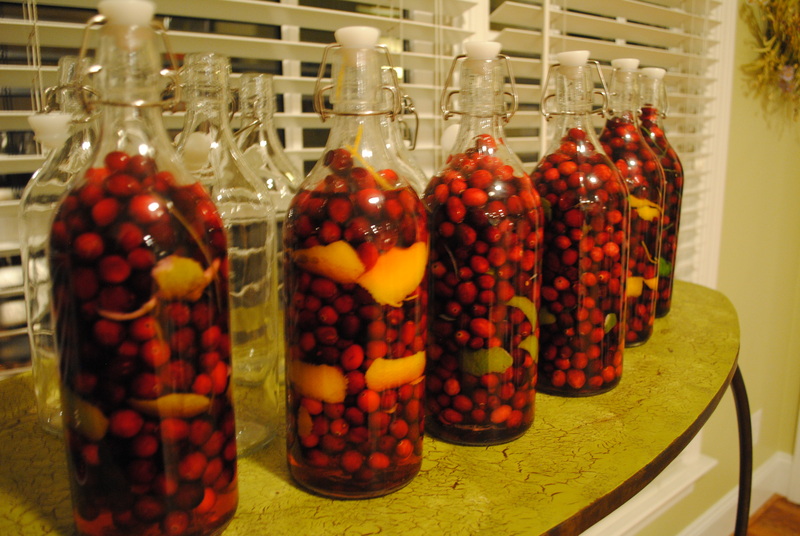 You can not skip this step, as the cranberries are too hard and won’t flavor the Vodka as much as you’d like. I tried numerous ways to do this. Find one that you like the best and stick to it. 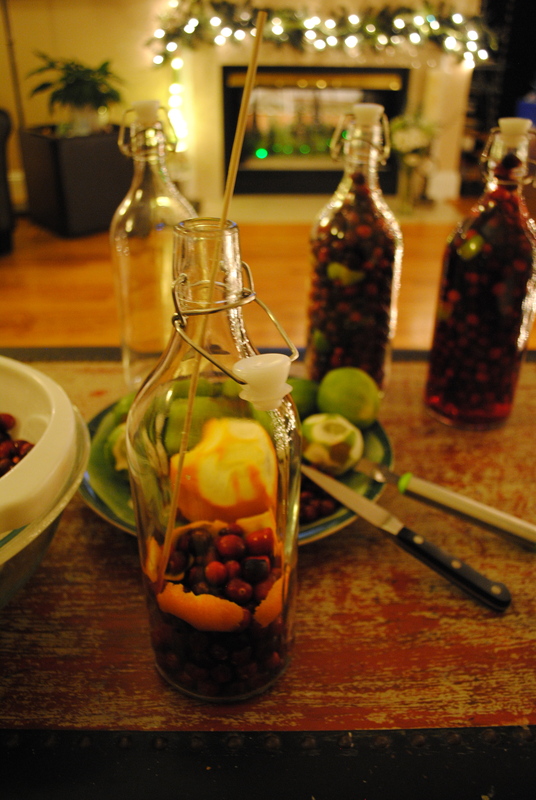 I poked a bunch of holes and then tried to funnel them into the bottle….unsuccessful because the cranberries were too large to fit through the funnel. Then I did it one at a time…took too long. Finally I settled on taking 2 larger or 3 smaller cranberries and hold them between my middle finger, pointer finger and thumb for balance and use my right hand to pop the berries with my skewer. That was I could do 2 or 3 at a time and it seemed to speed up the process. (I found that trying to hold any more resulted in flying and rolling cranberries as I tried to drop them into the bottle!!!!) Also, discard any cranberries that are smushy, mushy, or bad! You do NOT want them in your beautiful bottles! 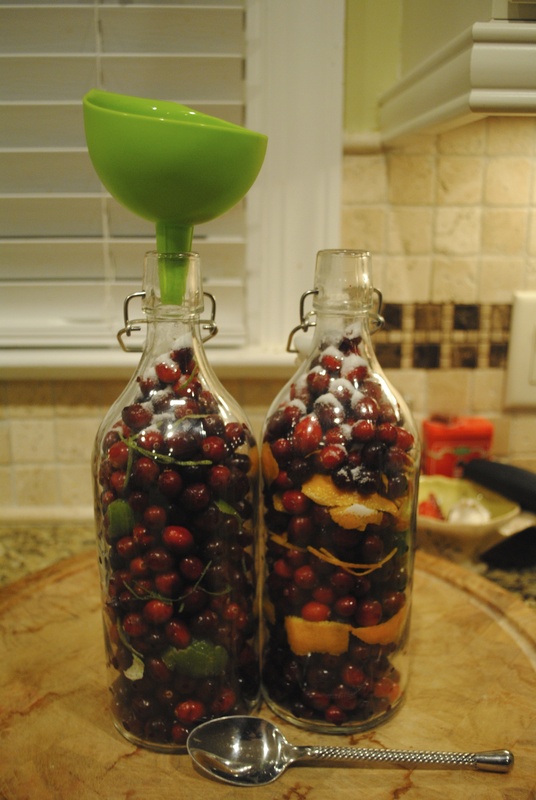 I also found that to fill up 1 bottle, it took OVER 1 bag of cranberries. So, be prepared. This is NOT a quick project and it took a lot more cranberries than I realized!!! 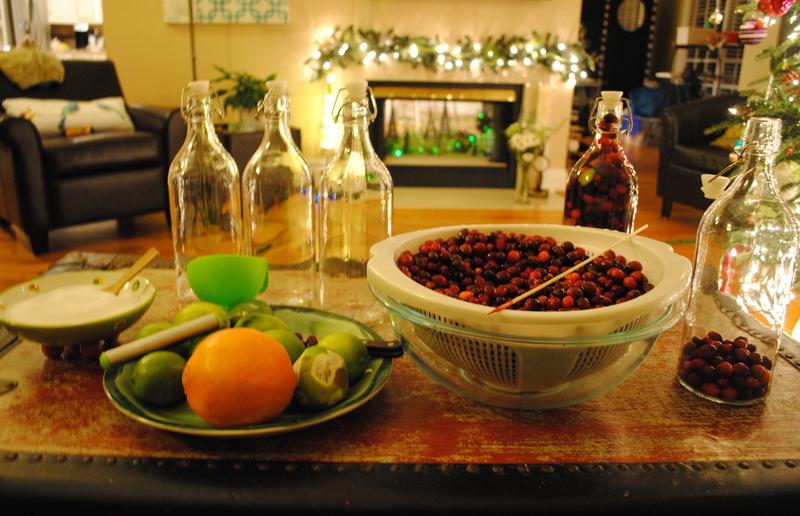 TIP: Be sure to rinse your cranberries well. I put them in a colander then into a glass bowl for drainage. Also be sure to wash your limes and oranges well, as you will be using the peel and zest. I, personally, bought organic for this reason. I ALWAYS buy organic when I can, but especially when I am using the outer peels! TIP: This is why I love using the Bamboo Skewer, it’s the best tool I found to pop the cranberries easily and long enough to put down into the bottle to adjust your citrus peels if need be! Using your Pairing Knife, carefully cut some of the peel of the Lime or Orange and drop it into the bottle. Repeat about 4-6 times depending on the size of your peels. Using your skewer, adjust peels to look pretty! You can also add swirls of zest here if you have a zester! 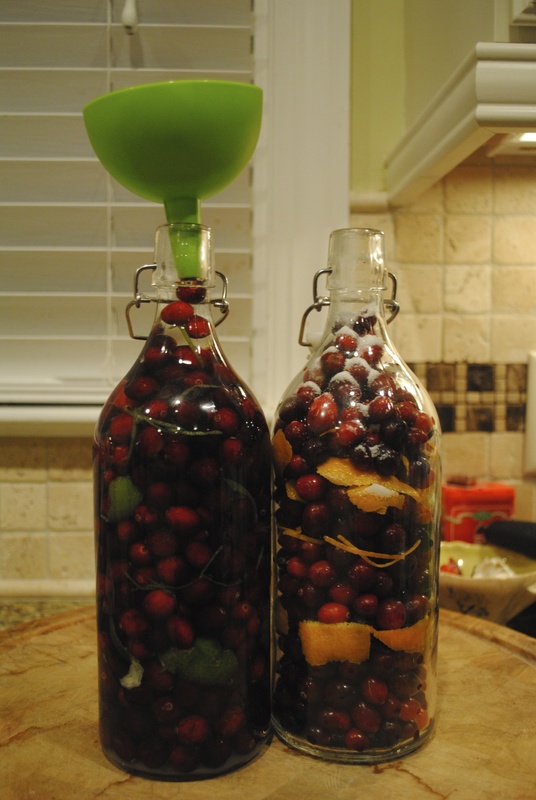 Fill up bottle with more Cranberries until 2/3 Full. Repeat Previous Steps Adding Peels and Zest. 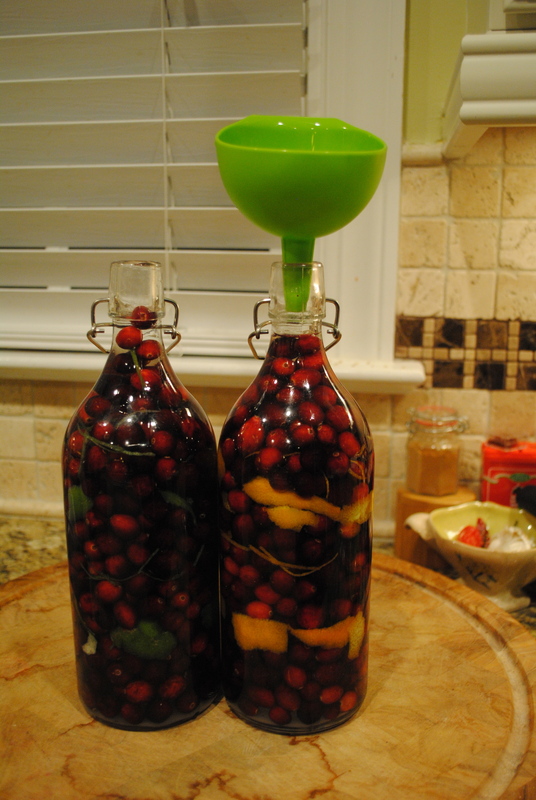 Fill with Cranberries to the Top! Bottles Full and Ready for some Sugar! 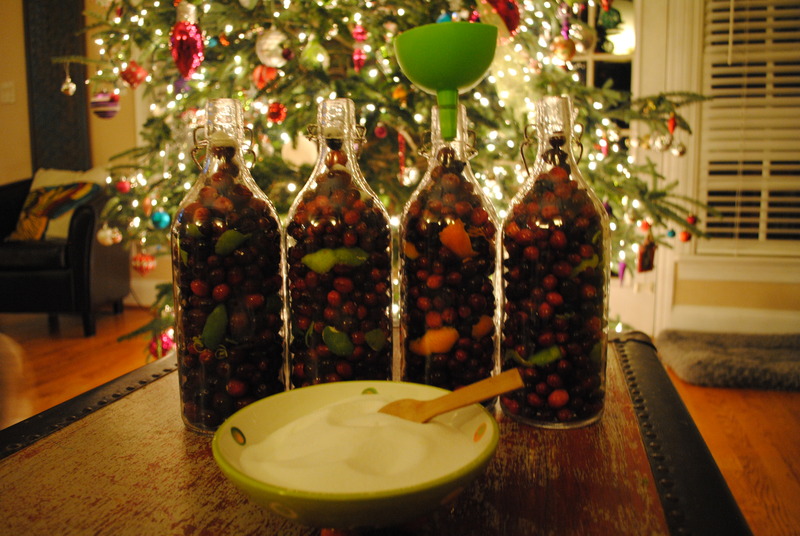 Using your Funnel, Fill each bottle with a spoonful of sugar to sweeten it just a little. Simply Gorgeous, I just had to share this pic! Bottle on Left has Vodka Added. Bottle on Right has Sugar. When you fill your bottles with Vodka, be sure to fill it all the way to the top!!! Then Seal Bottles with Stopper and Shake/Tip Over a few times to help the Sugar Dissolve. TIP: You want to go give it a shake every day or so to make sure there is no sugar settling at the bottom. These will keep for a few weeks to months! 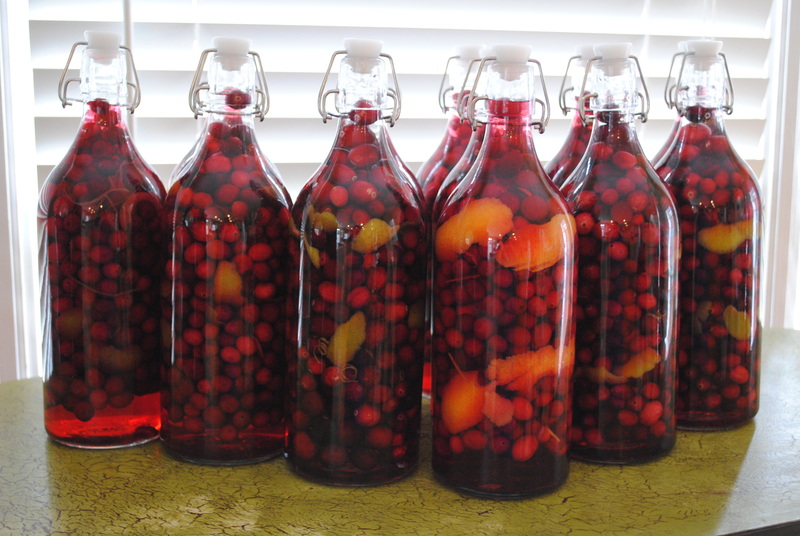 Be sure to do them a few weeks ahead of time so the Vodka has sufficient time to absorb all the yummy flavor!!! You can see where the Vodka has absorbed and needs a topping off! 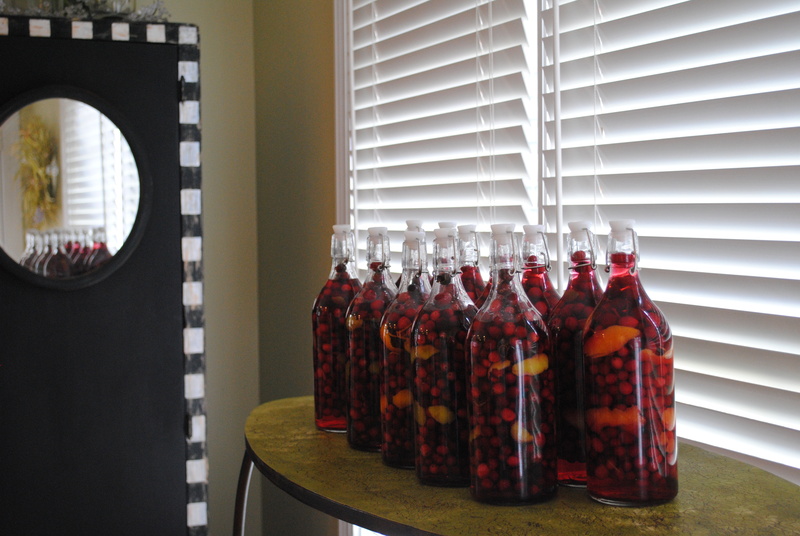 Some of the Vodka will steep into the Cranberries and you will have to “top of the bottle” with Vodka again the next day… and possibly one more time after that as well. 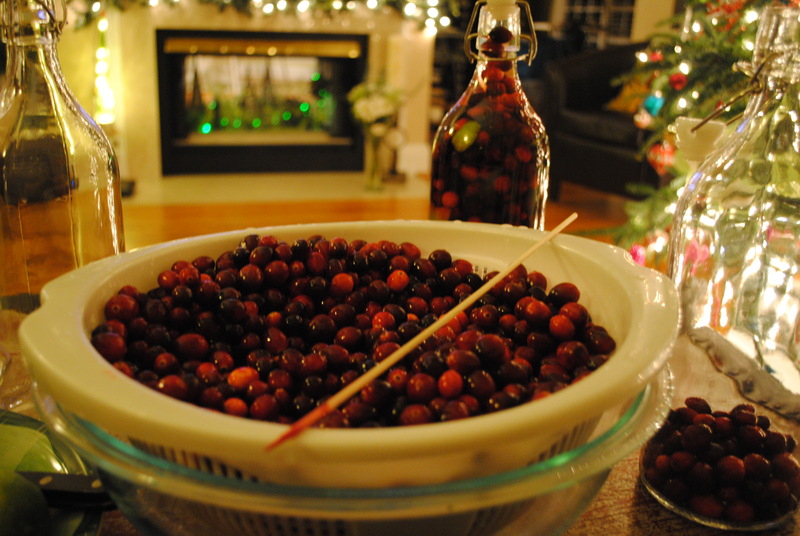 TIP: You want to be sure your cranberries are covered at all times so they won’t be likely to mold!!! The bottles in front are in need of a Second Topping off! Again, don’t let any of those cranberries be uncovered!!! Just Give Em a Quick Vodka Topper! Tie with beautiful ribbon and add a sweet note. 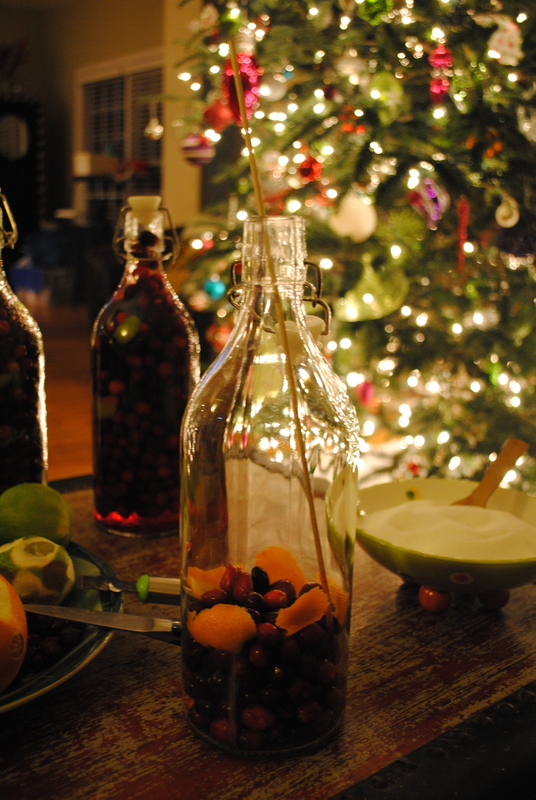 For a Festive Drink: Mix with Soda Water, Sprite, Lemonade, Cranberry Ginger-ale, or Simply on the Rocks! 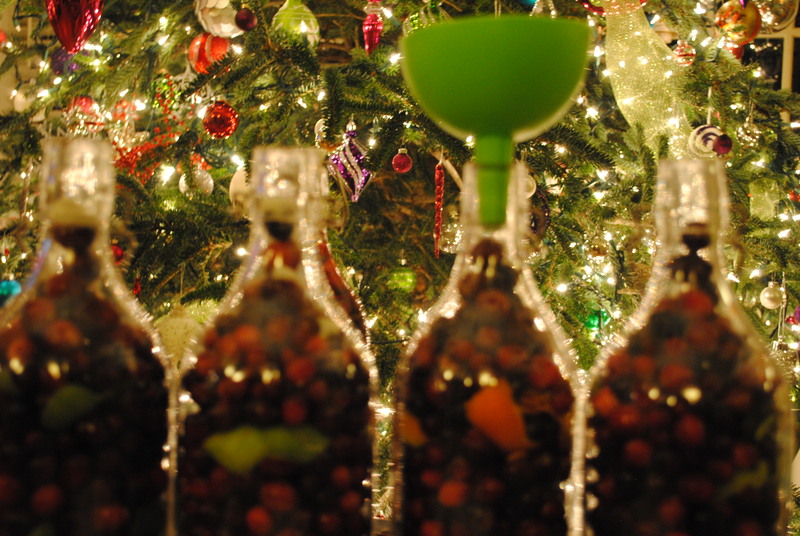 Or Make a Festive Holiday Martini!!!! 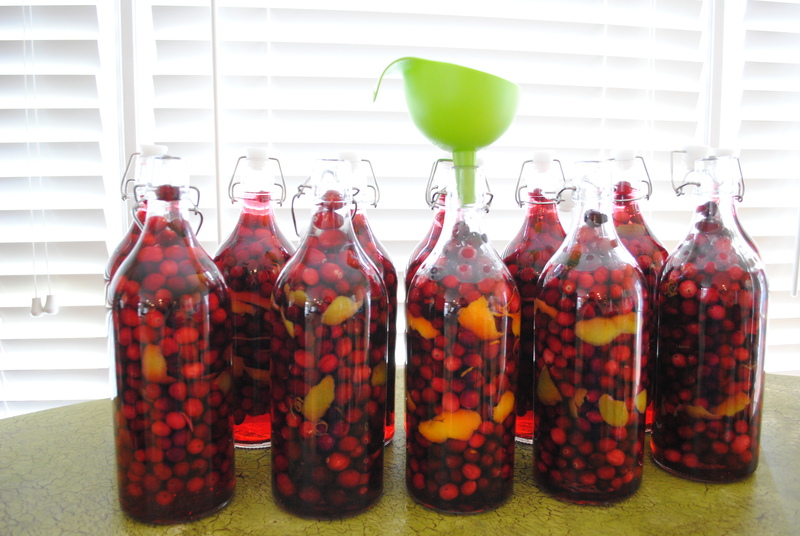 Waste Not, Want Not TIP: Use all the leftover fruit to make Flavored Water!